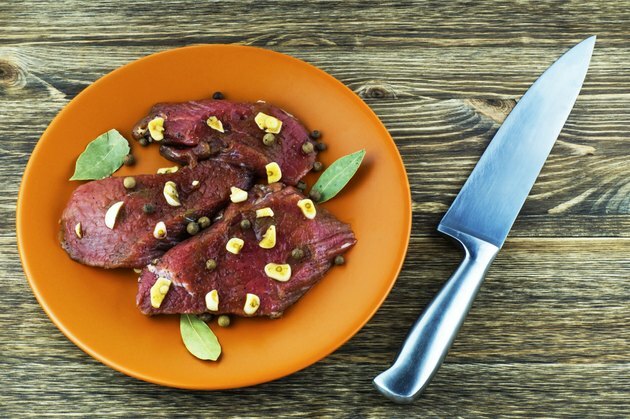 Many steak recipes call for a marinade, as they add flavor and tenderize the meat. While most recipes call for discarding the marinade before cooking, you can also cook a steak in the marinade. However, in order to cook a steak in the marinade, take basic steps for making sure that your steak is properly cooked and not contaminated by the marinade. Marinades contain three basic ingredients -- an acid such as vinegar or lemon juice, oil such as olive oil, and spices such as salt and pepper. This blend of ingredients helps to provide flavor and tenderize the meat before cooking. The basic marinating process can last several hours to several days, depending on the recipe. While most recipes call for discarding the marinade after being in contact with the meat, you can boil the marinade to destroy any bacteria, notes the U.S. Department of Agriculture. After boiling the marinade, cook the steak in the marinade, basting the meat during the cooking process or brushing it on the cooked beef as a sauce. Braising is a common cooking process that uses liquid. During the braising process, you can add extra herbs and spices to the marinade for extra flavor. To braise steak in the marinade, brown the steak first on a skillet, cover it with the marinade and cook slowly, letting the steak simmer in the marinade. Take several safety precautions to ensure that all bacteria or foodborne illnesses have been destroyed. For example, use new marinade for cooking instead of using the same liquid that you used in the marinating process. Keep the marinade in the refrigerator and discard leftover marinade after cooking. Always cook the steak to an internal temperature of 145 degrees Fahrenheit, according to the U.S. Department of Agriculture.